These two photos posted on Instagram, Twitter and Facebook yesterday received a lot of comments and requests for a recipe so I have decided to post the recipe today. I have been making this cake for so long, I don't really know where I got the recipe. I think, originally my mom used to make a version of it, but over the years I have tweaked it and finally came up with one that my family really loves. Preheat the oven to 350'F. Grease and flour a 10" tube pan. Cream the butter with the sugar in a mixer with the paddle attachment for about 5 minutes until smooth and light. Add the eggs one at a time, beating after each addition, then add the vanilla and sour cream. Turn off mixer, add flour, cornstarch, salt, baking powder and baking soda. Turn mixer on low and mix until combined. Using a spatula make sure all dry ingredients are completely mixed. 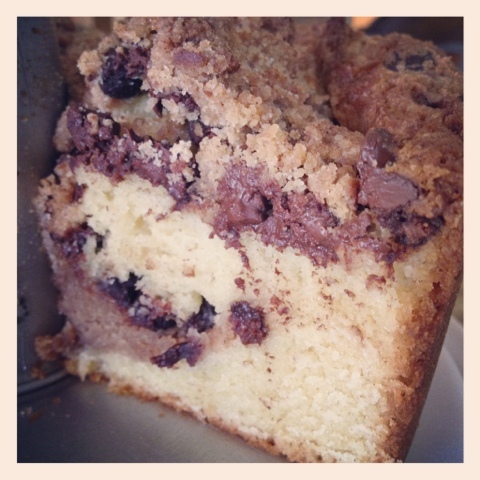 For the filling, mix everything but the chocolate chips with your fingers, until crumbly. Spoon half of the batter into the prepared pan, top with half the filling mixture and half the chocolate chips. 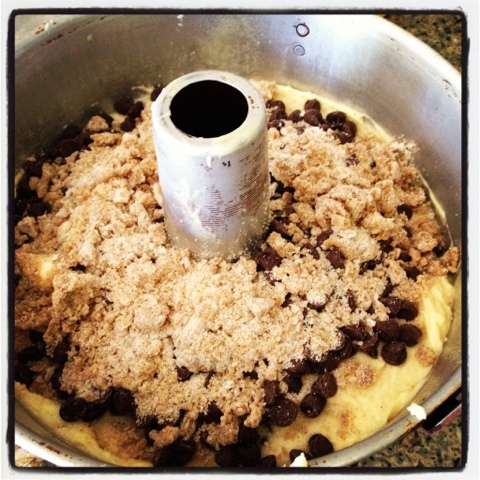 Repeat with remaining batter, chocolate chips and filling, ending with the filling mixture. Bake for 50-60 minutes until a cake tester comes out clean. Let cool on a wire rack for 30 minutes and then remove from the pan. After the cake is completely cool, carefully remove from the tube and place on a serving plate, filling side up. Enjoy as a dessert, for breakfast or a snack. Thanks so much for sharing this! I agree with Susan! That looks pretty good. :) It would be great to make for brunch. Thanks for sharing the recipe! Looks delish! Thanks for sharing! You are just a wealth of information and post the best stuff! 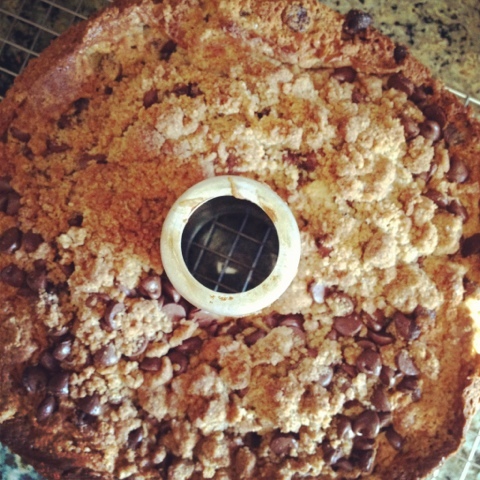 Thanks so much for sharing - will make this tomorrow and cannot wait to taste it. Oh, nearly breakfast time! Yum! Looks so good Di, I think our Dad's will be eating this on Sunday, thanks. You are making me wish I could cook! This cake sounds wonderful. I will need to keep the recipe and try it. Thank you for sharing. That looks SO tasty! I'm eating healthy though, so I don't want any! Nope. None. I don't want it! Looks fantastic! Just one question, still, about the butter...is it supposed to be "sticks" instead of "cubes"? I am not at home to see how many ounces a stick is, but I believe it's 4 oz. Thanks...I'll be trying this ons very soon!